When you live in Wisconsin, it’s easy to take frozen custard for granted. Those outside the Midwest may think of custard as simply soft serve, a lie promulgated by a national ice cream chain that shall remain unnamed. It’s true that custard comes from a machine like soft serve but that’s where the similarities end. Custard is smooth, rich, and dense with the addition of egg yolks and the subtraction of air – spoons stand straight at attention, just like those commercials for Dennison’s chili from my childhood proclaimed. Custard makers work hard to keep the percentage of air in their product low to make for a dense dessert that more extrudes rather than releases from the machine valve. It’s even regulated by law – the FDA requires custard to contain 10% butterfat and 1.4% egg yolks. That might not sound like many yolks but many ice creams contain no yolks – the yolks are crucial to custard’s satiny finish. 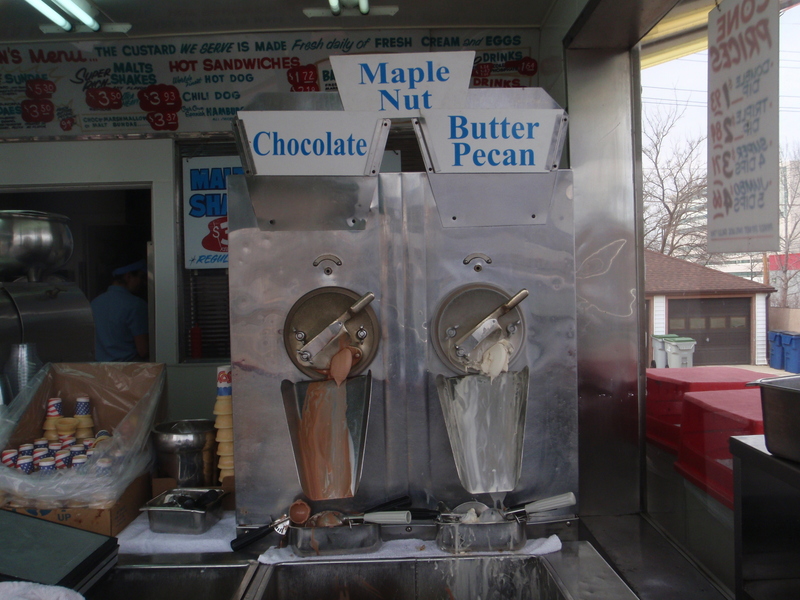 Most places offer vanilla and chocolate with a rotating daily flavor or two. Custard is expensive and time-consuming to make, which is why you won’t find dozens of flavors. On a mission, we set out for Milwaukee to taste some of the state’s finest. 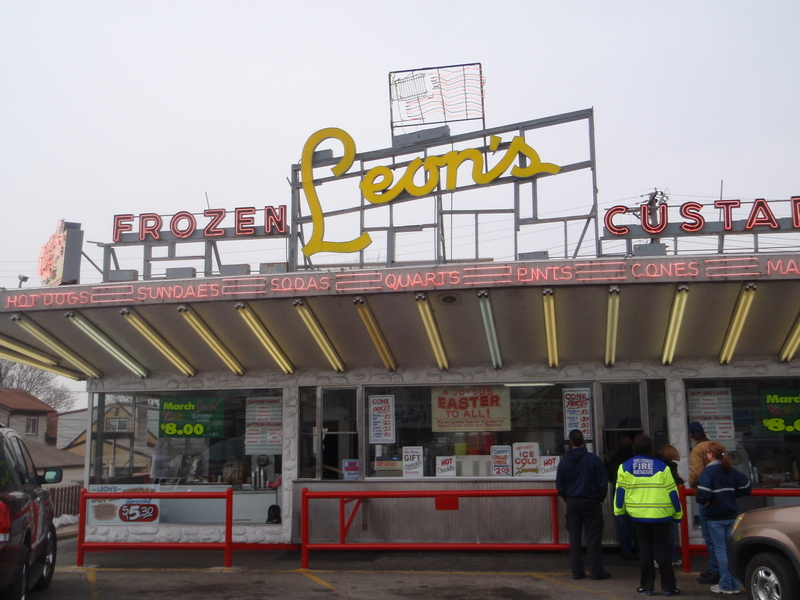 While I wouldn’t ordinarily consider temperatures hovering around 50 to be ice cream weather, when it’s been so cold for so long (below 0 on the first day of spring, friends), 50 degrees feels like 80 and you can happily stand in the parking lot of Leon’s Frozen Custard licking your cone. (Vanilla for me and the featured flavor, maple nut, for my husband, in case you wondered.) 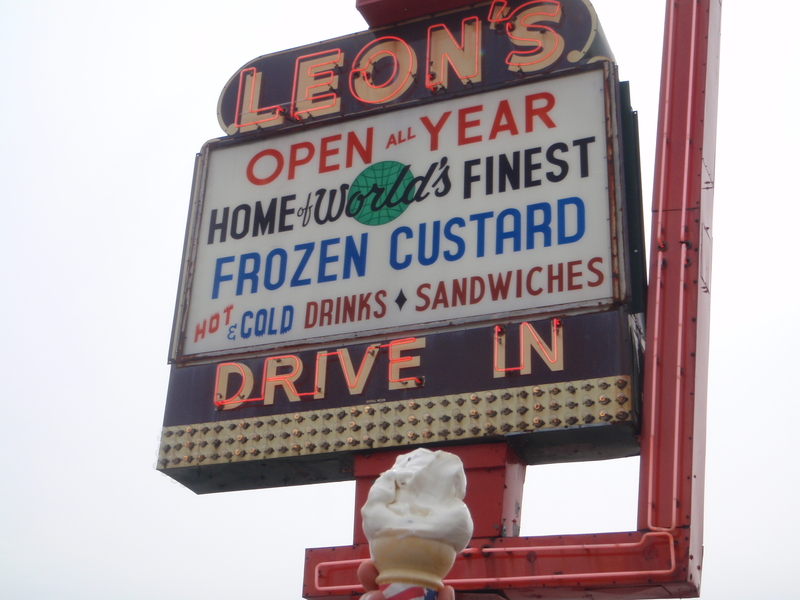 An added bonus: Leon’s supposedly inspired the drive-in concept for the TV show “Happy Days,” one of my favorites. Truth be told, we did not confine ourselves to custard alone – we also had ice cream for our two cone lunch – but being in America’s Dairyland, we figured we still did Wisconsin proud.